Happy New Year to all Cavan Singers, especially those singing Auld Lang Syne at the Masquerade Ball in the Town Hall tonight. Cavan General Hospital Oncology Unit Carol Service was held in the Kilmore Hotel at 11am on Saturday morning. It is a bittersweet service always, prepared and attended by the staff of the unit, along with families of patients, and the "Friends" of the unit. 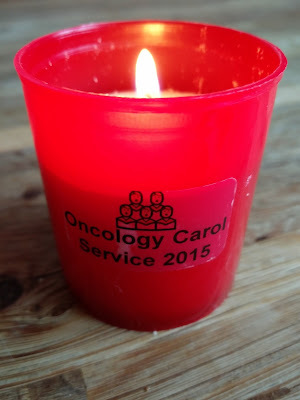 We love to sing this service, and we love the candles we are offered to take home to light at Christmas. 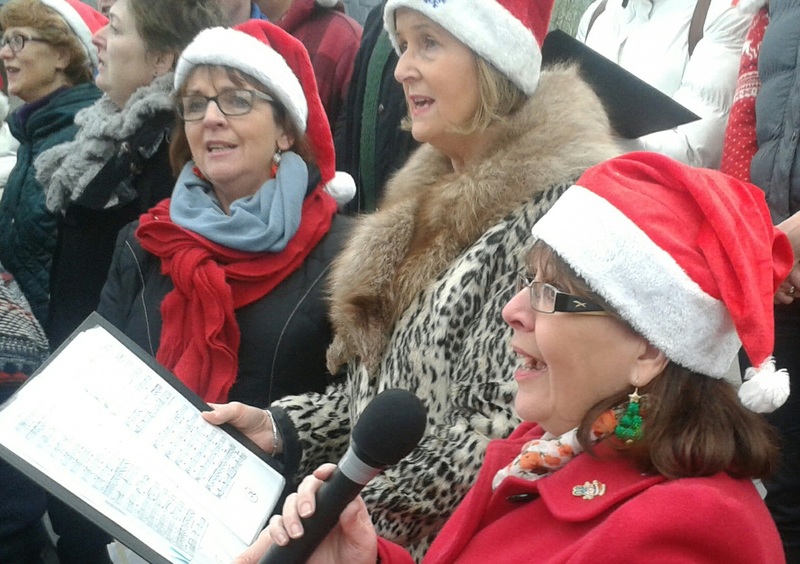 We sang on the Town Square in Cavan from 2pm to 4pm on Saturday afternoon. We sang a mixture of sacred and "silly" seasonal songs, and the passers-by seemed to enjoy it because they filled our buckets, and we will be handing over a generous amount to our two charities, SOSAD and Good Morning Positive Age. We finished our Christmas season as the guests of the Cavan Baptist community. We sang with the congregation, and we also for them sang The Old Man, our "coming home for Christmas" song, written for us by former MD, Paul Flynn. It was lovely to sing it right underneath Slieve Glagh, the landmark it mentions. Our thanks to Rev Ivan Watson, and Carol Watson (alto), for the invitation, and the hospitality, offered to us once again. Big big thanks, this season as ever, go to our hardworking volunteer "Road Crew", led by Gerry O'Keeffe and Colm Crowe. Without this team, the rest of us divas and divos would be sunk! 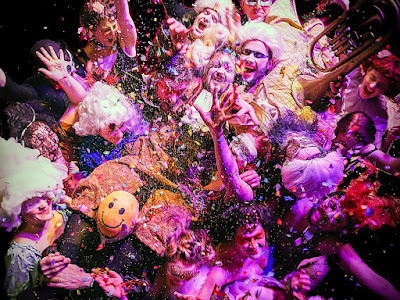 Here's to another wonderful year singing together - and what a year 2016 promises to be! 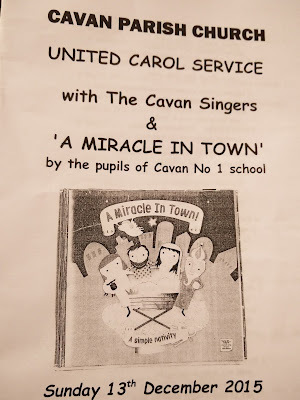 Tonight we sang for a large congregation in Cavan Cathedral - and we certainly sang as past in one of the biggest "casts" we have taken part in. (Memories of Voices of the World in Roma fadó fadó, anyone?). The programme was a great mix of traditional and new, which the people present really loved. All choirs sang individually and together. 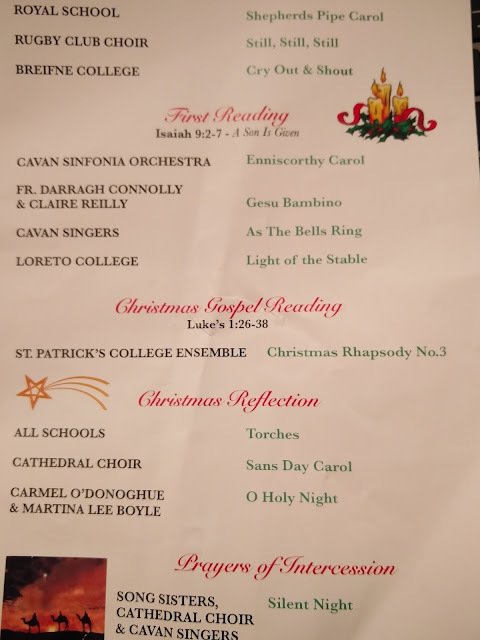 Our soprano Martina Lee Boyle led the singing of Once in Royal David's City as well as sharing the lead in Oh Holy Night with Carmel O'Donoghue (Song Sister and Cathedral Choir soprano). As well as those hymns listed there, we sang the Sussex Carol and the Hallelujah Chorus with the Cathedral Choir, and the final hymns sung by all 7 choirs, and the congregation was O Come All Ye Faithful / Adeste Fideles. Special mention must go the the bravura piece, Christmas Rhapsody no 3, from St Patrick's College Ensemble led by our own former Musical Director, Ciaran Tackney. The combination of chorus and musicians was spinetingling. We need to see this Ensemble perform again in Cavan soon. We had our own special "Green Room" behind the altar, where we waited while we were not performing. Thanks to Hugh Tunney (bass) and Garret Maguire for our own special TV monitor which meant we could see the service, which was wonderful. This is the second of our Christmas performances. Three more to go before Sunday. No doubt about it - 'tis the season to be singing! 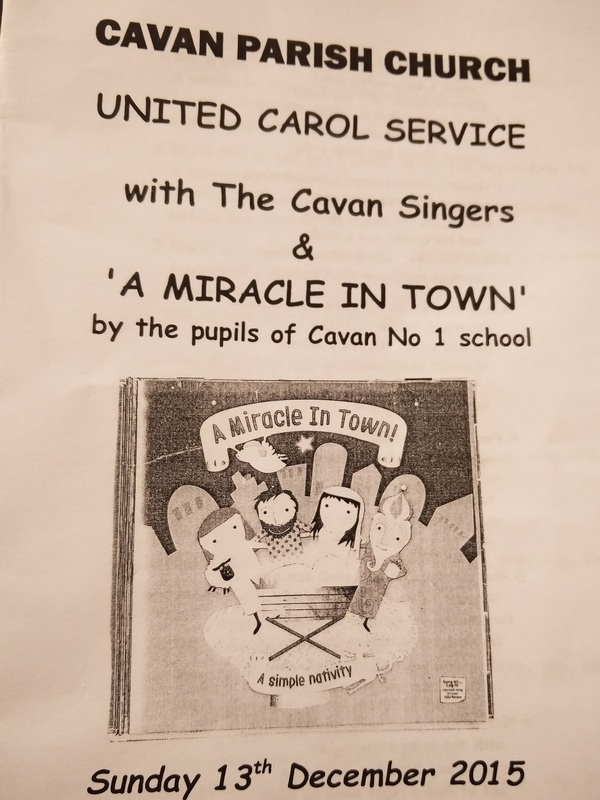 It was lovely for us to attend the Nativity Play and sing in the Carol Service in Cavan Parish Church this evening. Well done to the Shepherds, Innkeepers, Narrators, Singers, Musicians, Camels, Sheep, Angels, Kings, and Cowboys (yep!) of the Cavan No.1 School student cast, and to their teachers. With our MD Eileen Tackney conductiong, and Sue King as accompanist, we sang with congregation their seasonal hymns - Once in Royal David's City (solo Brian McKeever, Bass), Joy to the World, Silent Night, O Come All Ye Faithful and Hark the Herald Angel Sing. 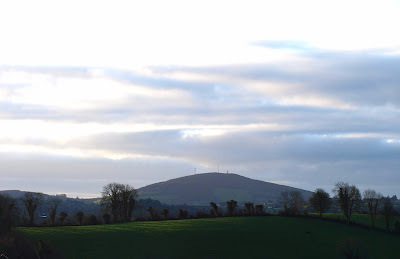 We also sang one of our current carols, As The Bells Ring by Bob Chilcott, and the ever anticipated O Holy Night, with solos verses from to of our sopranos, Martina Lee Boyle and Paukine Brady. Thank again to the Church committee who provide us with much appreciated refreshments in the school hall after the service. We have taken part in this annual service every years since our foundation in 1984, and it marks the real start of Christmas for many of us. Once again we have entered the Lyric FM Choirs for Christmas competition. This year we recorded The Old Man, a new piece by our own Paul William Flynn. Thanks to Sue King and the students from Cavan Institute for the engineering, and to Fr Kevin Donohue ADM for allowing us to use St Clare's Chapel. Keyboard is Sue King, Violin is Amy Kelly, Soprano solo is Martin Lee Boyle. 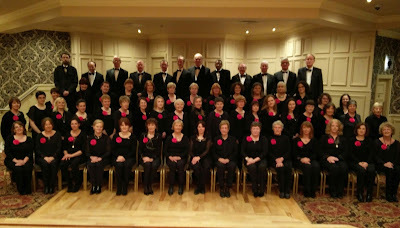 Conductor is our MD Eileen Tackney. Listen out for us on the "wireless" between now and Christmas. It is always good fun when it is time for us to have a formal group picture taken. We have to remember to come to rehearsal in our "uniform", and we have to get sorted. 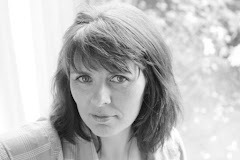 Stage Manager Frances Galligan has been volunteered for this role each time. Think family pic, but with almost 70 kids in the frame! Thanks to the very helpful Kevin from the Kilmore for helping us out.